3 Bedroom Detached House For Sale in Glasgow for Offers Over £185,000. Immediate internal viewing is strongly recommended to fully appreciate this well appointed detached villa by Persimmon Homes which offers outstanding accommodation throughout which is tailor made for todays discerning family buyer. The property comprises entrance hallway, cloaks wc, formal lounge, fully fitted kitchen with family dining area that offers access to the rear garden from double glazed French doors, utility room, upper landing, three bedrooms, master en suite shower room and family bathroom. The property is enhanced by double glazing, gas central heating, landscaped garden grounds and privately owned parking bay. 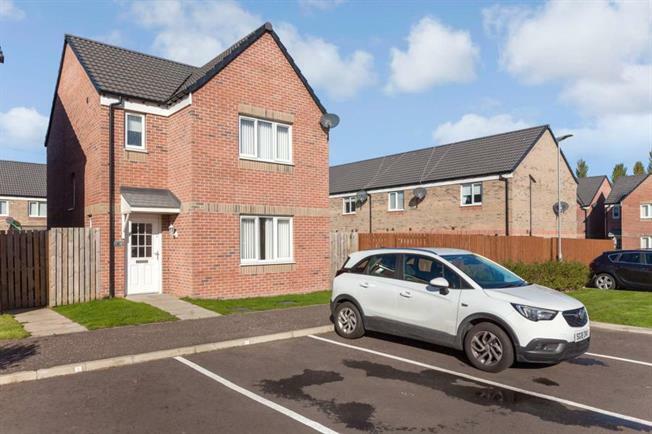 The property is further enhanced by the close proximity of a wide range of amenities that include local shops, Morrisons supermarket, schools and easy access to Glasgow and beyond via both railway and motorway alike. Immediate viewing is of paramount importance !